Dental amalgam is the end result of mixing approximately equal parts of elemental liquid mercury (43 to 54 %) and an alloy powder (57 to 46 %) composed of silver, tin, copper, and sometimes smaller amounts of zinc, palladium, or indium. It has been widely used since the mid 1800s. Ever since dentists first started installing amalgams in patients' teeth there has been an issue as to whether the dose of mercury is released from them and causes health (pathophysiologic) problems. For those interested in further researching the mercury/amalgam controversy we suggest two sites: www.iaomt.org and www.amalgam.org Here are some telling videos. "The potential for harmful health effects resulting from mercury exposure from mercury/silver amalgam dental fillings is no longer a matter of scientific debate. Such adverse effects have now been documented and reported by qualified medical scientists. Serious questions exist regarding mercury's role in loss of kidney function, Alzheimer's Disease, and a host of neurological disorders. My client, the International Academy of Oral Medicine and Toxicology (IAOMT) has compiled and reviewed all relevant scientific documentation and has found a total lack of scientific rigor to support statements that chronic exposure to mercury from dental amalgam is harmless to patients. I am sure you and your attorneys are all too aware of the potential for product liability under Restatement of Torts, Section 402A and other relevant law. In view of the totality of the information that is now available, not only does it seem likely that there will be an avalanche of product liability in the future, but that for those companies which continue to market the product, there will be a real potential for the assessment of punitive damages, much as we have seen against the asbestos industry. We believe it in your company's best interest, as well as in the interest of public health, that all use of mercury as a dental filling material cease immediately. The IAOMT has more specific information if you desire." The above letter was sent to the CEOs of 31 major amalgam manufacturers. In March 2006, in an effort to mitigate the harmful effects of ingesting mercury amalgam during drilling and amalgam removal, the IAOMT developed a protocol for amalgam removal. Explanation of IAOMT position: A logical, much needed additional defense against the acute absorption of the mercury released during mercury amalgam removal. Purpose of the Scientific Review: To prevent patients from absorbing non-suctioned off and potentially toxic mercury from mercury amalgam particles when drilling out. Scientific Review History: Ingested Activated Charcoal Capsules have been suggested to prevent absorption of non-suctioned mercury from amalgam particles from the digestive tract. This procedure enhances the prevention of mercury absorption through all oral soft tissues as well. It is inexpensive, simple, fast and tasteless. Briefly describe the Scientific Review: Before mercury amalgams are drilled out have the patient rinse and swallow a slurry of activated charcoal powder and water. Activated charcoal has long been known and used to absorb toxins, drugs and poisons from the human body. It can absorb up to 10,000 times its own weight in toxins. Powder is the most effective form. 1. In a small disposable cup, dissolve 1 teaspoon of activated charcoal powder in 1 ounce of water. 2. 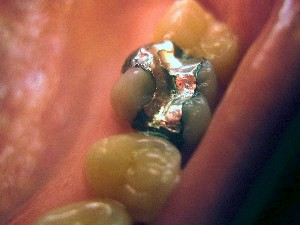 Before removing amalgam, before anesthetic, have the patient briefly rinse then swallow the slurry. 3. The oral mucosa and tongue will be coated with the black powder to prevent the absorption of non-suctioned mercury and amalgam particles and the digestive tract will benefit from better protection as well. 4. As soon as all amalgam has been drilled out, thoroughly rinse the visible black powder from all accessible mucosa with water spray and suction for at least 45 seconds. Activated charcoal will absorb all drugs taken two hours prior or two hours after ingestion. Ensure patient has not taken or will not take any important medication (birth control pills, antibiotics, chronic disease medication, etc) in the two hours before or two hours after ingesting the charcoal. If the patient has taken medication in the critical time period, have him/her rinse and spit out the charcoal back in the cup to protect the oral mucosa only at this time but not swallow the mixture. Prescribe charcoal to be ingested later if deemed appropriate. Activated charcoal does not absorb vitamin or mineral supplements.